Movie-Made Business Tip #1: Business is all about networking. The Godfather films show us the right way to do business, and a whole lot of wrong ways to go about it. The elder Godfather in the films, Vito Corleone (Marlon Brando,) is the source of most of the good advice to be gleaned from this cinematic classic. Vito is a master of networking, creating a “family” that extends beyond the people biologically related to him to encompass seemingly everyone in his community. He does this by making offers and delivering on his end of the bargain. Movie-Made Business Tip #2: Make them an offer they can’t refuse. The Godfather series makes our list twice because it contains another valuable lesson worth mentioning. You see, Vito Corleone is actually building a vast network by turning himself into a lead magnet. You come to him, he hears your troubles, and he makes an offer (that “you can’t refuse.”) In return, he asks for something, payable often at a later date. You’ve seen something similar, right? An eBook offered in exchange for your email address, or a white paper offered in return for your business contact details; both are examples of contemporary lead acquisition tactics. Acquiring leads hinges on offering and asking in equal measure. For so long as Vito Corleone was the Godfather, his “services” over-delivered on expectations, and asked only a comparatively small “favor” in return, strengthening and reinforcing his network in the process. 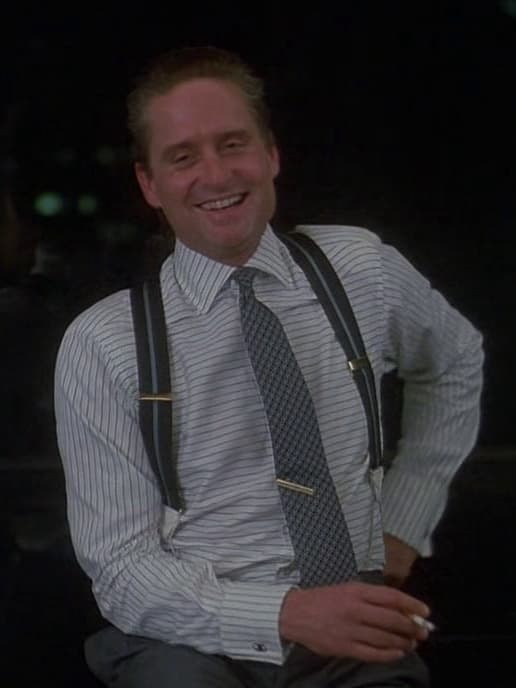 Along with his horizontally-striped shirt, this quote is perhaps one of the most enduring takeaways from Mr. Gordon Gekko (Michael Douglas.) In an age when every brand is engaged in content marketing, mostly for free, those most valuable nuggets are the ones that come at a price. Sometimes the price isn’t obvious, at least in terms of money. On the Web, content is traded for information, which eventually leads to a sale. When content is worthy of consumption, it’s worth paying a price for it. See, before Gekko and his protégé, Bud Fox (Charlie Sheen), violated several federal trade regulations, the original fictional Wall Street “wolf” did get at least a few things right. Movie-Made Business Tip #4: Use data to your advantage. In the classic James Bond movie, Goldfinger, Bond (Sean Connery) finds himself strapped to a table by villain, Auric Goldfinger (Gert Frobe.) As the laser slowly angles toward his torso (shall we say,) he nervously wiggles and, judging by the look on his face, he seems to wrestle with finding a witty way out. Bond decides to go with what he knows, and the audience is in on the fact that that’s not very much. “Choose your next witticism carefully, Mr. Bond. It may be your last,” Goldfinger taunts. “Do you expect me to talk?” replies Bond. “No, Mr. Bond, I expect you to die,” replies the villain. And with that, Bond locates within his mind the valuable data for which he has been probing. “Operation Grand Slam,” a tiny morsel of intelligence overheard while eavesdropping earlier in the movie, is the best Bond can come up with. Bond knows nothing more than the words “Operation Grand Slam” themselves, but Goldfinger is sufficiently impressed that Bond is “resourceful” and orders him released from the table. That little snippet of data was enough to close the sale, so to speak. When you’re engaged in selling and you’re hearing a lot of “no,” you can infer a reason why based on what you already know about the customer. Would the customer be better served by your resources, rather than your dead-weight? That’s what you need to work through in your mind in the heat of sales process, just like James Bond did when he was on Goldfinger’s table. Movie-Made Business Tip #5: It’s hard to argue with a friendly face. Okay, so admittedly, our list has had a heavy dose of testosterone up to this point. Perhaps, you might say, it’s had an overdose. The movie character Truvy Jones (Dolly Parton) utters the memorable line, “Smile. It enhances your face value,” a statement that carries with it some deep implications for business professionals. The main thing to take from this tip: negativity has no place in business. It’s easy to relate the need to smile to face-to-face businesses. But there’s a definite correlation in online business. Keep your communications pleasant, sending over a virtual “smile” that begins with your greeting and ends with your signature line. Movie-Made Business Tip #6: Always negotiate in any deal. In the famous Pretty Woman scene in which Vivian (Julia Roberts) and Edward (Richard Gere) negotiate her fee for a week of, err, “services,” the audience sees a very clean, concise exercise in business negotiations. Vivian highballs (again, err), and Edward undercuts what he is willing to pay. That’s what you should take from the scene: in most situations, assume the other side is negotiating for their advantage. You should do the same. In the end, it’s revealed that Vivian would have settled for one thousand less; Edward would have paid as much more. So the negotiation was equitable. Most of them are. Movie-Made Business Tip #7: Use your powers for good. The latest theatrical iteration of Superman, Man of Steel, has many underlying meanings to be discerned. In the movie, Clark Kent (Henry Cavill) loses two fathers from different worlds, though their lessons remain with him in different ways. Ultimately, Clark faces only one choice in life and it’s a highly philosophical one; nevertheless, the decision that Clark must make has parallels in the world of business. Given his superpowers, Clark can only choose to be absolutely good for the world, or absolutely evil. As a teenager, his human father teaches him that he can’t just hit the boys who tease him; a strike from his powerful, solar-enhanced arm would likely be a deathblow to the average human. Clark must choose the higher path, in all situations. The real lesson for Clark is that while teasing him is insulting, because of his unique abilities, his retaliation would be unfairly severe. Clark had to learn how to use his powers fairly. Your business is the same. If you bid a job at a grossly low rate for a friend, while asking an exorbitant fee for a new customer, and that customer finds out your “friendly discount” rate, you’re likely to lose the customer. This is good in all situations in which you submit a business proposal because, with fairness, (and knowing when not to negotiate) you benefit from pricing consistency. Just think of all the businesses that have friendly-discounted themselves out of business. Like Superman, the only path to sustainable business is the path of fairness. After you get done watching these great movies, check back soon for Part Two of this series, in which you’ll find seven more business tips you won’t want to miss. Oh, and feel free to share your best movie business tips in the comment space below.